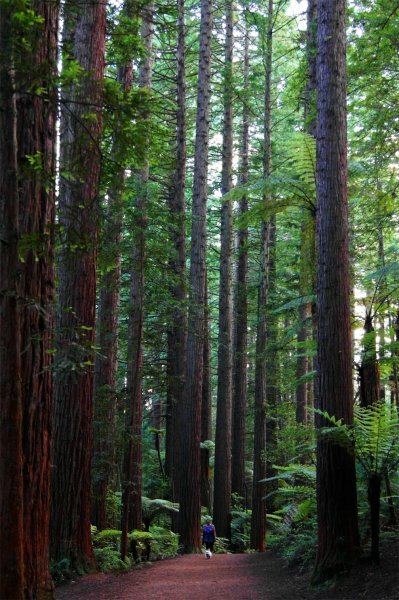 This is known as Redwood Memorial Grove and is a one species stand of approximately 203 trees. They were planted in 1901 and have remained a pure stand. They were pruned in 3 lifts to 12.3m with the last lift in 1938. Another Larch stand was under-planted with redwoods in 1969 (Cowan, B. 1994). 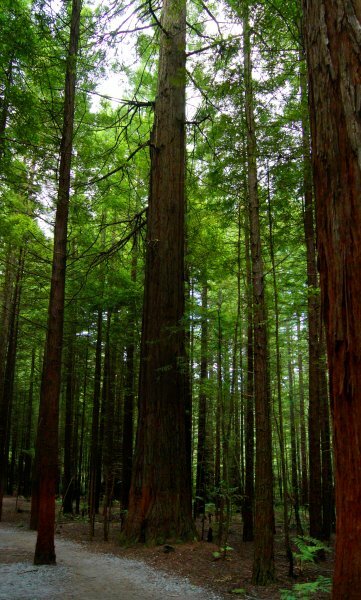 In 1925 the grove was declared a memorial to commemorate New Zealand Forest Service members who died in World War I.
Click on the following link to read a full history of Whakarewarewa Forest and to see what recreational facilities there are in the area www.redwoods.co.nz. Over all vigor and vitality of the stand is excellent (2013). 10 Jan 2013 Smillie, M.J.
14 Jul 1994 Cowan, B. A short drive south east of Rotorua township. Long Mile Road can be accessed off Forest Research Village Road or Tarawera Road.